How many of you have ever said, “Why should I care about all of this Social Media stuff”? I think many of you have, because that was me! I believed that Social Media was for the next generation; not for someone like me. I used to think that text messaging was not for me either. I didn’t think I would ever have the need to send a text. I figured, if someone really wants to talk with me, then they could pick up the phone and call me. However, as a mother of two teenagers, I quickly learned how important texting was to them. I found that if I called them, they wouldn’t answer, but if I texted them…I would get a reply instantly. Then I learned, how easy it was to send a mass text to reach multiple family members and friends. Reaching out to the masses was FABULOUS! One text sent and I would receive many responses back. I got the message out quickly and the whole process saved me valuable time. As soon as I thought I was in the “KNOW” with texting, Facebook arrived—an entirely new way of sharing information. Facebook is the original, true Social Media platform. It is a way to stay connected to even more family and friends, and also a great way to find old acquaintances. Once again, it was my kids who introduced me to this new way of communication. Facebook is instantaneous and a way of seeing what is happening in the present. It’s the best thing ever! We all have those friends or acquaintances who we don’t see often. But when we do, it’s great to be able to mention something that you saw on Facebook and pick up as if the distance and time had never passed…. And that is what Social Media is: reaching the masses – sharing information – staying connected. My kids are now grown and no longer live at home; and Social Media has since grown well beyond Facebook. Our agents and company partners now use Social Media in so many ways, that it is vitally important for us, as a company, to learn these platforms to stay informed and reach our clients on all levels of communication. 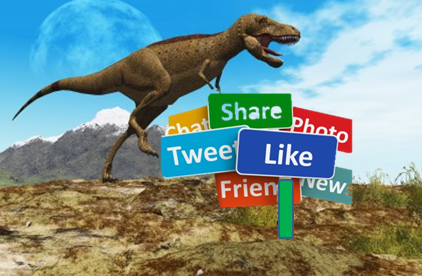 Follow me on my journey to learn the different Social Media platforms and go from being a Social Media Dinosaur to becoming a Social Media Diva. This entry was posted on March 3, 2015, 7:21 pm and is filed under Uncategorized. You can follow any responses to this entry through RSS 2.0. Both comments and pings are currently closed.